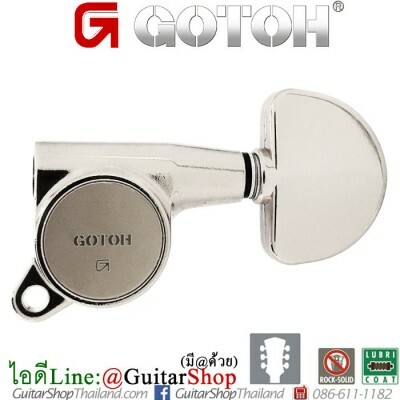 Condition: New ลูกบิดกีตาร์วินเทจ Gotoh SD90 นิเกิลMade in Japan Gotoh SD90-05MN 3L3R Guitar Tuning Machines Head Set of 3 right, 3 leftFinishes: NickelIncludes sleeves and screws *กรุณาตรวจสอบขนาดและรายละเอียดของสินค้าให้แน่ใจว่าตรงกับสิ่งที่ท่านต้องการก่อนทำการสั่งซื้อ .. 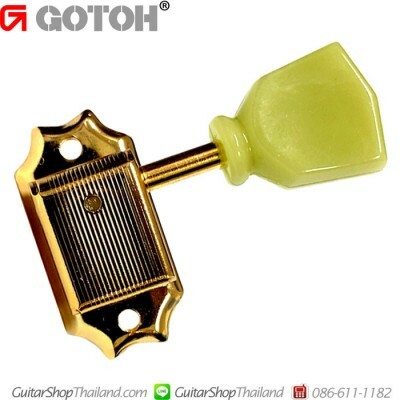 Condition: New ลูกบิดกีตาร์วินเทจสีทอง Gotoh SD90 SL Made in Japan Gotoh SD90-SL-NI Guitar Tuning Machines Head 3L3R Set of 3 right, 3 leftFinishes: GoldKluson Style for old American guitarsButtons : Greenish Keystone buttonsRatio 1:15Includes sleeves and screws *กรุณาตรวจสอบขนาดและรายละเอียดของสินค้าให้แน่ใจว่าตรงกับสิ่งที่ท่านต้องการก่อนทำการสั่งซื้อ .. 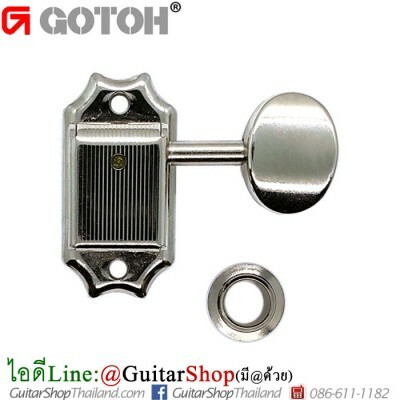 Condition: New ลูกบิดกีตาร์สองทางโกโตะ Gotoh SG301-20C L3R3Model SG301Finish ChromeGear ratio 1:18Button 20Head Type L3R3ROCK-SOLID posts prevent the rocking of string postLUBRI-COAT lubrication for smooth action and longer lifeIncludes bushings and screwsMade in JapanLink To G-Gotoh Website *กรุณาตรวจสอบขนาดและรายละเอียดของสินค้าให้แน่ใจว่าตรงกับสิ่งที่ท่านต้องการก่อนทำการสั่งซื้อ .. 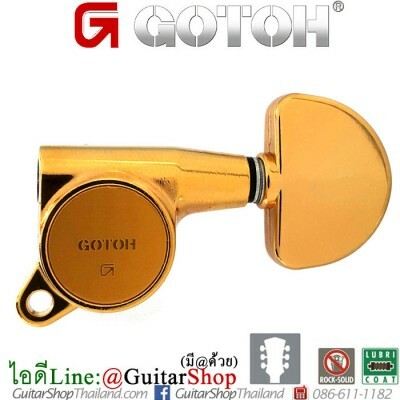 Condition: New ลูกบิดกีตาร์สองทางโกโตะสีดำเงา Gotoh SG301-20CK L3R3Model SG301Finish Cosmo BlackGear ratio 1:18Button 20Head Type L3R3ROCK-SOLID posts prevent the rocking of string postLUBRI-COAT lubrication for smooth action and longer lifeIncludes bushings and screwsMade in JapanLink To G-Gotoh Website *กรุณาตรวจสอบขนาดและรายละเอียดของสินค้าให้แน่ใจว่าตรงกับสิ่งที่ท่านต้องการก่อนทำการสั่งซื้อ .. 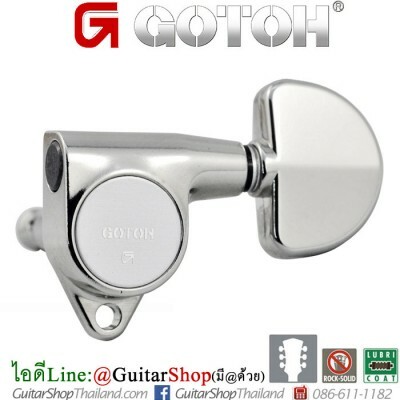 Condition: New ลูกบิดกีตาร์สองทางโกโตะ Gotoh SG381-20C L3R3Model SG381Finish ChromeGear ratio 1:16Button 20Head Type L3R3ROCK-SOLID posts prevent the rocking of string postLUBRI-COAT lubrication for smooth action and longer lifeIncludes bushings and screwsMade in JapanLink To G-Gotoh Website *กรุณาตรวจสอบขนาดและรายละเอียดของสินค้าให้แน่ใจว่าตรงกับสิ่งที่ท่านต้องการก่อนทำการสั่งซื้อ .. 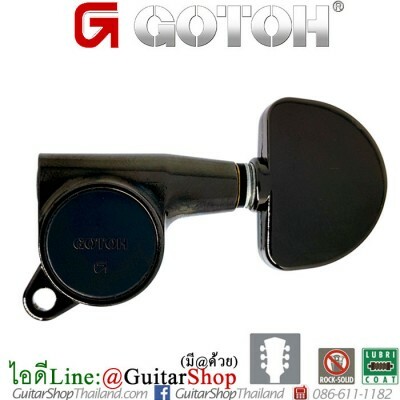 Condition: New ลูกบิดกีตาร์สองทางโกโตะ Gotoh SG381-20CK L3R3Model SG381Finish Cosmo BlackGear ratio 1:16Button 20Head Type L3R3ROCK-SOLID posts prevent the rocking of string postLUBRI-COAT lubrication for smooth action and longer lifeIncludes bushings and screwsMade in JapanLink To G-Gotoh Website *กรุณาตรวจสอบขนาดและรายละเอียดของสินค้าให้แน่ใจว่าตรงกับสิ่งที่ท่านต้องการก่อนทำการสั่งซื้อ .. 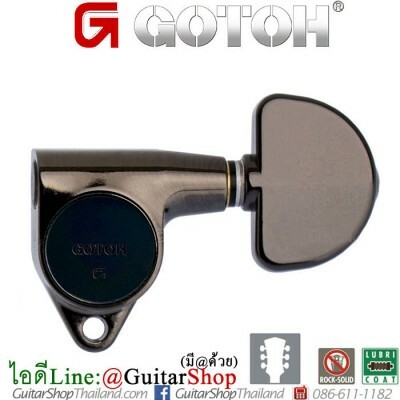 Condition: New ลูกบิดกีตาร์สองทางโกโตะ Gotoh SG381-20GG L3R3Model SG381Finish GoldGear ratio 1:16Button 20Head Type L3R3ROCK-SOLID posts prevent the rocking of string postLUBRI-COAT lubrication for smooth action and longer lifeIncludes bushings and screwsMade in JapanLink To G-Gotoh Website *กรุณาตรวจสอบขนาดและรายละเอียดของสินค้าให้แน่ใจว่าตรงกับสิ่งที่ท่านต้องการก่อนทำการสั่งซื้อ .. 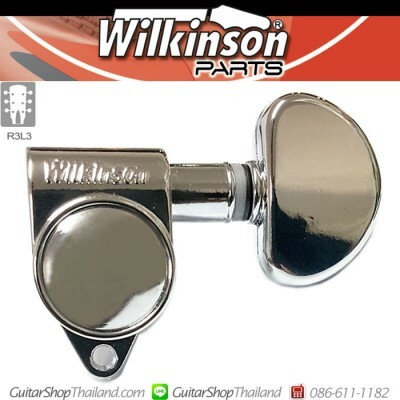 Condition: New ลูกบิดกีตาร์ Wilkinson Grover-Roto Stlye Black Wilkinson machine heads tuners Part Number : WJ-303-C Made in Korea Wilkinson 3+3 chrome finish guitar tuners. Full size "Roto" style housing with kidney bean shaped buttons. Sealed gear housing is permanently lubricated for long service life. Requires 3/8"(10mm) peghead holes. Each key mounts with a single screw tab. 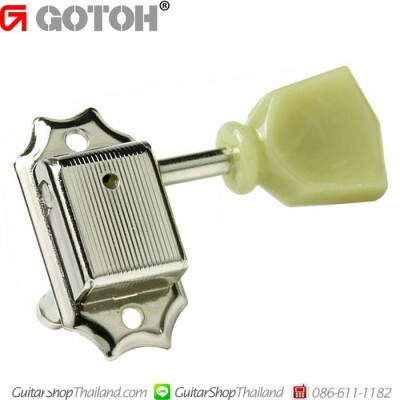 Includes screw-in bushings, face washers, and mounting screws.*กรุณาตรวจสอบข.. 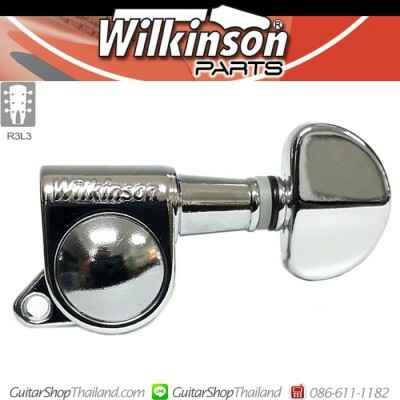 Condition: New ลูกบิดกีตาร์ Wilkinson Grover-Roto Stlye Chrome Wilkinson machine heads tuners Part Number : WJ-303-C Made in Korea Wilkinson 3+3 chrome finish guitar tuners. Full size "Roto" style housing with kidney bean shaped buttons. Sealed gear housing is permanently lubricated for long service life. Requires 3/8"(10mm) peghead holes. Each key mounts with a single screw tab. 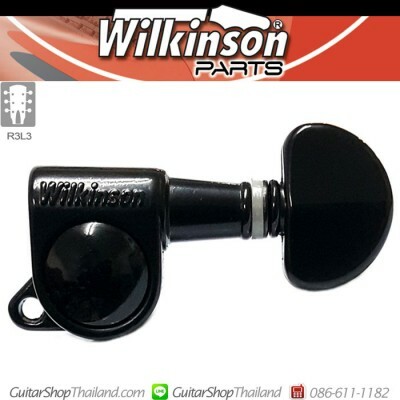 Includes screw-in bushings, face washers, and mounting screws.*กรุณาตรวจสอบ.. 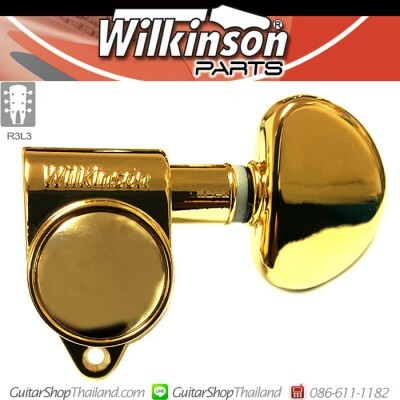 Condition: New ลูกบิดกีตาร์ Wilkinson Grover-Roto Stlye Tuners WJ-303 GoldWilkinson machine heads tuners Part Number : WJ-303-G Made in Korea Wilkinson 3+3 gold finish guitar tuners. Full size "Roto" style housing with kidney bean shaped buttons. Sealed gear housing is permanently lubricated for long service life. Requires 3/8"(10mm) peghead holes. Each key mounts with a single screw tab. Includes screw-in bushings, face washers, and mount.. 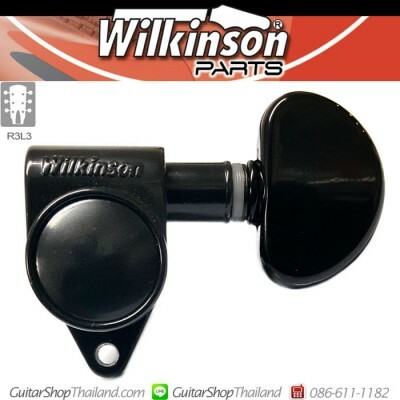 Condition: New ลูกบิดกีตาร์สองทางวิลกินสัน Wilkinson Mini ROTO Style Tuners WJ-703M สีดำครบชุด 3x3 Guitar Tuning Pegs Keys, Machine Heads Product Description: A 6 set of Wilkinson 90° ROTO Knob Black Machine Heads, these heads are a complete replacement set. These machine heads are manufactured by Wilkinson; Wilkinson machine heads are made to highest quality, have a great 18:1 turning ratio and will last a lifetime. These heads have a larg.. 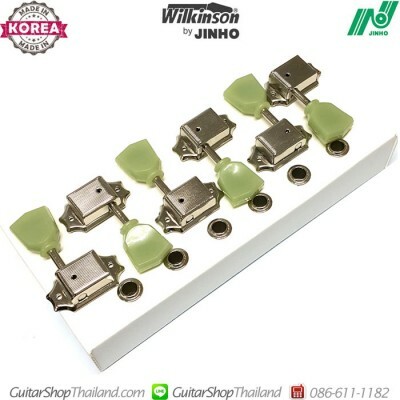 Condition: New ลูกบิดกีตาร์สองทางวิลกินสัน ลูกบิดกีตาร์ Wilkinson Mini Roto Stlye WJ-703 สีเงินครบชุด Product Description: A 6 set of Wilkinson 90° ROTO Machine Heads, these heads are a complete replacement set. These machine heads are manufactured by Wilkinson; Wilkinson machine heads are made to highest quality, have a great 18:1 turning ratio and will last a lifetime. These heads have a large 'ROTO' knob and a full size fully sealed gear hou.. 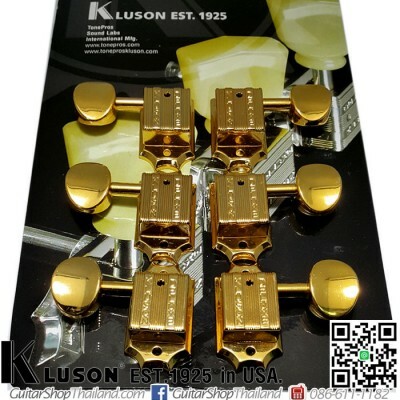 Condition: New ลูกบิดกีตาร์ Vintage Kluson Tuners Style Nickel Vintage Keystone style button J44-NI-R3/L3Basic location : R3/L3 Molded greenish plastic button Precision 15:1 gear ratio 1set of 6pcs Made in Korea by Jin Ho Instrument Co., Ltd. - JINHO เป็นโรงงานในประเทศเกาหลีที่ผลิตอะไหล่กีตาร์ OEM ให้กับแบรน Wilkinson เพื่อส่งจำหน่ายทั่วโลก.. *กรุณาตรวจสอบขนาดและรายละเอียดของสินค้าให้แน่ใจว่าตรงกับสิ่งที่ท่านต้องการก่อนทำการสั่งซื้อ ..